Franklin Matters: “It was pretty wild. I didn’t expect it"
"Imagine waking up and finding a piece of your own artwork showing up as the first post you see on Twitter; then Instagram; then Facebook. Before you know it, you can’t scroll through your social media accounts without it showing up, gaining hundreds of retweets and reposts. Well, this is exactly what happened to Franklin High School senior, Emma Trinanes. Trinanes has been drawing her entire life, pulling from her parent’s encouragement to be creative. 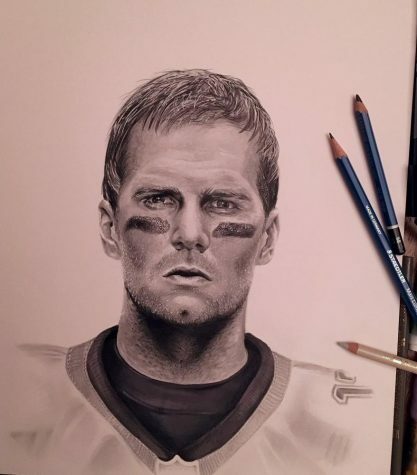 Inspired by her love for the New England Patriots, Trinanes decided to draw quarterback Tom Brady “back in February, [when] the Super Bowl was coming up. [She] figured it would be a good homage to [Brady]."